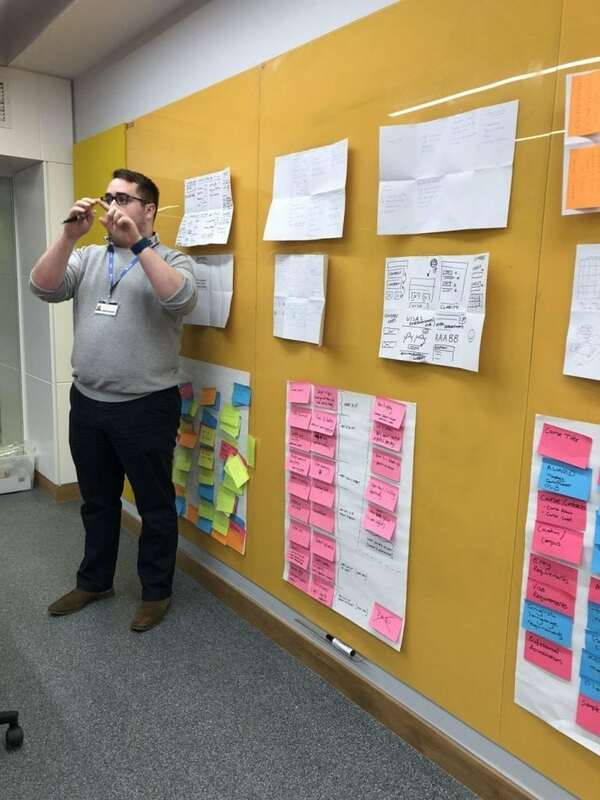 The first part of the Design Sprint saw Steve and I presenting some background information about the problem. We started with discussing user frustration. We then discussed the top tasks that have been identified and voted on by applicants and current students. This gave the participants evidence of the priority that content could be presented in. 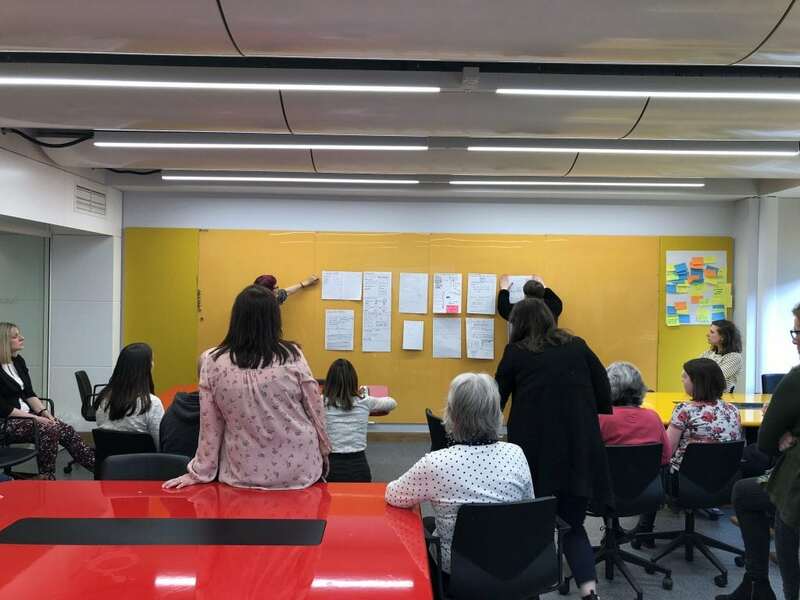 We then moved on to discuss the feedback that has been provided on the existing pages, using our feedback gathering tool. Using one of our analytics tools, we are able to select a page and see the incoming and outgoing paths for the page. 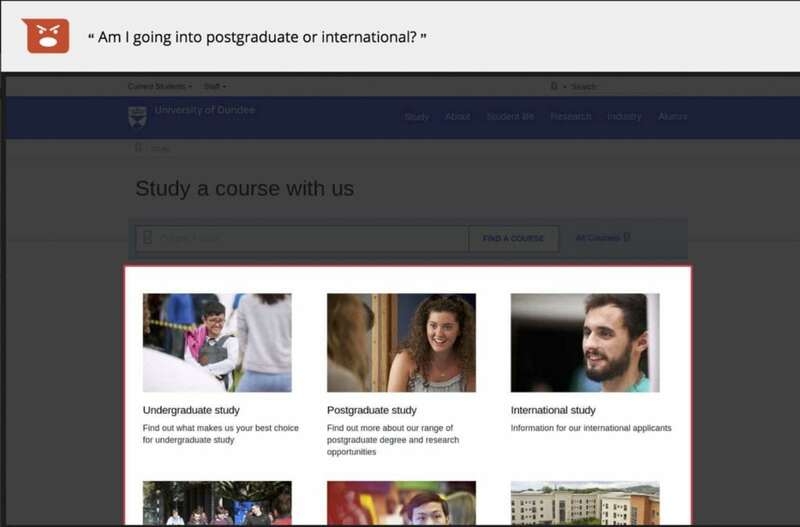 Below is an example of an existing undergraduate course page. We can see that just over 44% of the traffic to this page is being generated by search engines, such as Google, Bing and Yahoo. 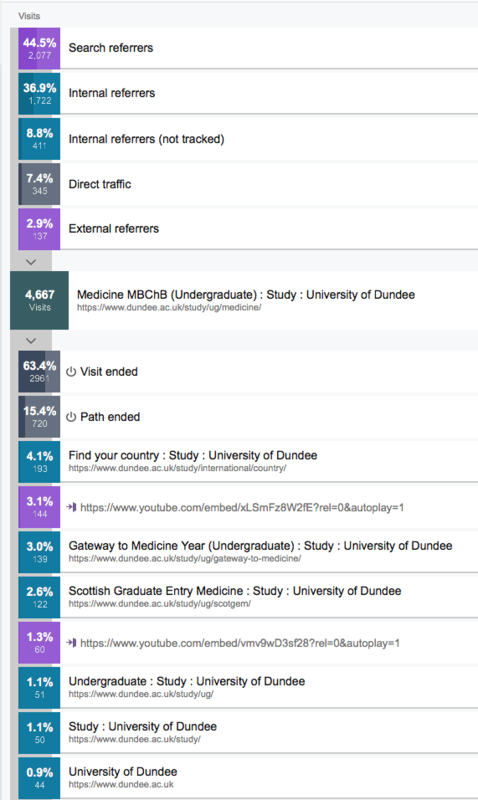 Almost 46% percent is coming from internal pages on dundee.ac.uk. 7.4% is direct traffic – this means someone has entered the web address directly or had it saved as a bookmark. Lastly, just under 3% is coming from external websites. After discussing the problem, we moved on to discuss how to define content requirements. We also went through the publication from HEFCE (Higher Education Funding Council for England) called “Guide to providing information to prospective undergraduate students”. This guide is to help higher education providers follow good practice in supplying easily accessible information for prospective students to use in their decisions about higher education study. We then handed over to the participants to brainstorm the content requirements for a course page and how it should be prioritised. 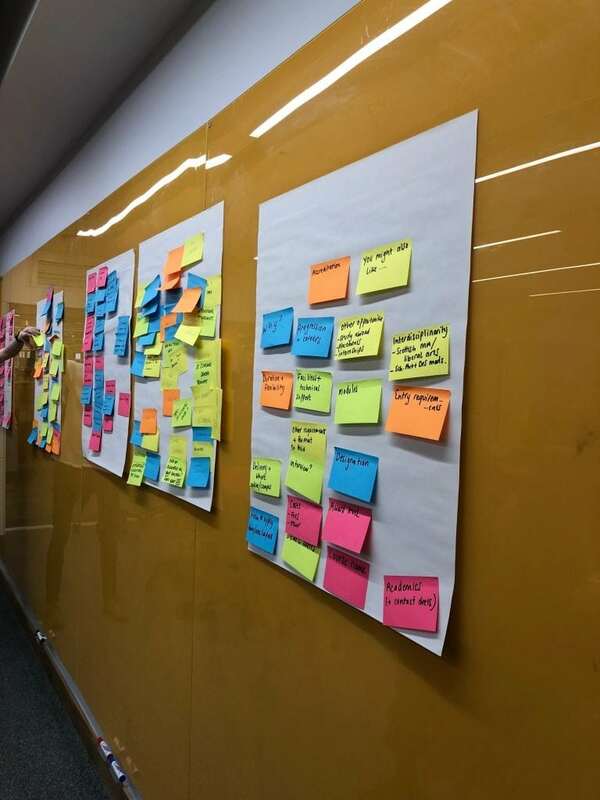 After the free lunch (come along to the next Design Sprint and you’ll get lunch too! ), we discussed how we could measure success by setting goals using HEART framework goals. We also discussed how the course page could adapt to different audiences. For example, depending on the location that someone is browsing from, would it be good for the user to see a reduced set of entry requirements? The participants fold a sheet of A3 paper into eight rectangles. They then sketch an idea in each rectangle or sketch a journey. We then give the participants the following guidance. After doing the Crazy 8s and voting, the participants were then given 30 mins to draw a solution taking inspiration on the ideas from the the Crazy 8s and what had been voted on. 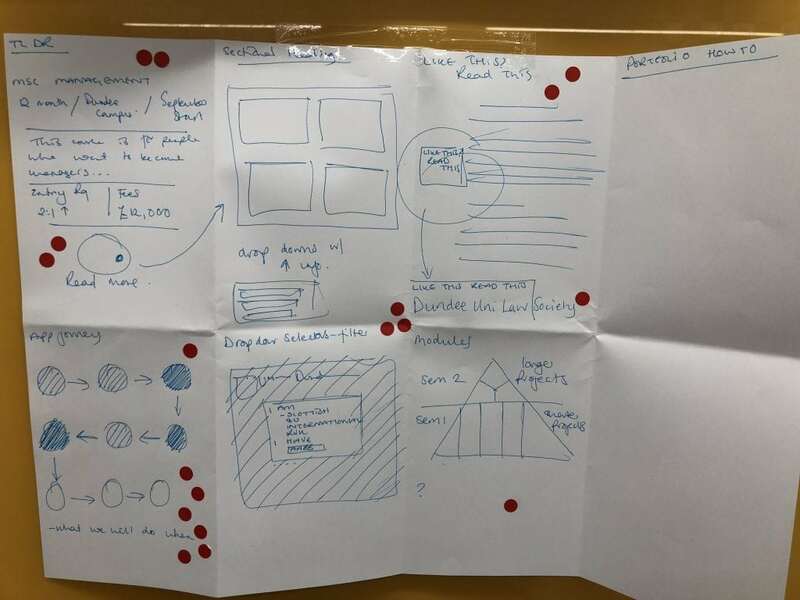 Once the discussion and voting had been completed, the group came together to discuss which elements from the sketches would make it to the prototype stage. To test the ideas from the voted solutions a prototype was designed by Steve, our Design Manager. Whilst this is not the final design, it allows us to share the prototype for testing and comment from the wider community. Please take a look at the course page prototype and add your comments (keeping in mind the problem we are trying to solve). This prototype has interactive areas that you can click on to see other pages and tips. We’d like to thank everyone that took a day out of their schedule to join us on the journey to a new course page experience. There were great ideas and discussions throughout the day and Steve and I were taking notes, furiously, the whole day to feed into the design process. 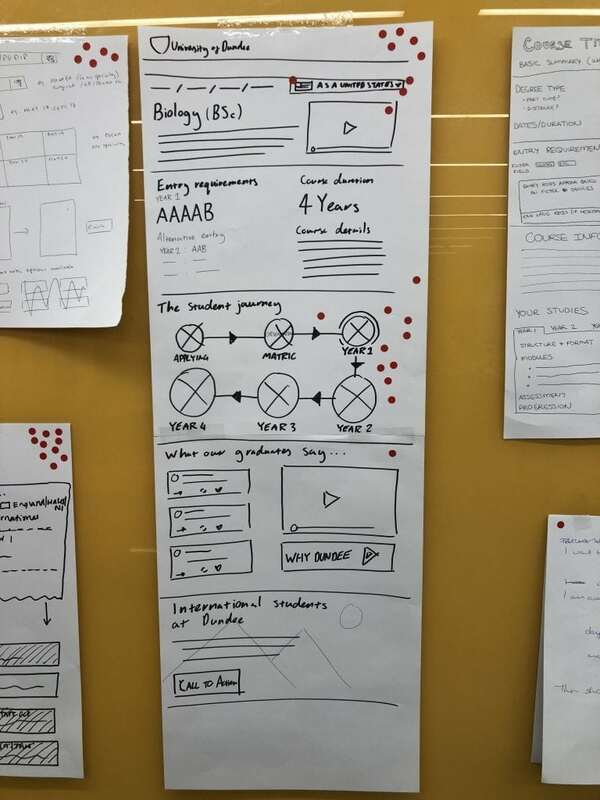 Didn’t make the Design Sprint? Join us at the next one. 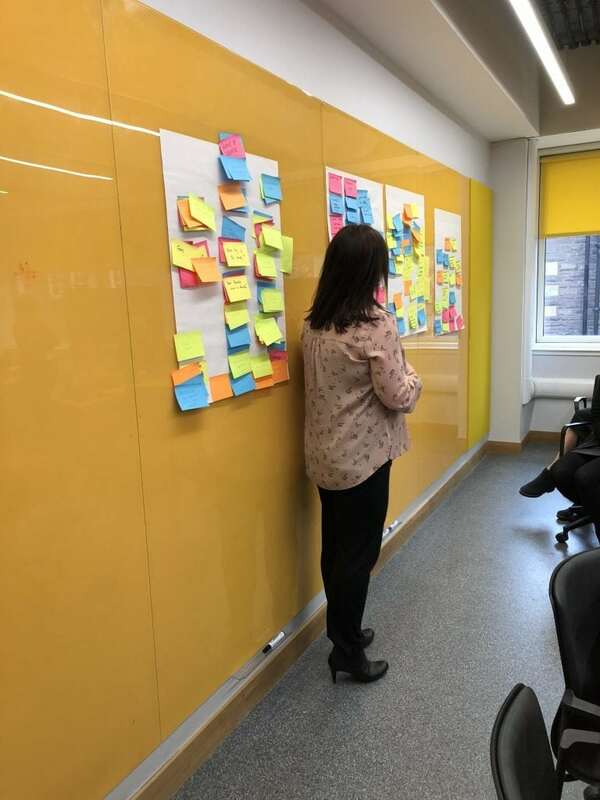 We have Design Sprints booked every two weeks on a Tuesday for the whole of 2018. Please see the list below and book onto a Design Sprint or two of your choice. A day may seem like a lot of time to commit, but when you consider that our website has over 3.5M visitors annually from every country in the world then it’s vitally important that we get this right. We can’t do that without engagement from the University community so anything you can do to either get involved, or encourage others to get involved, would be much appreciated!